"Best social listening tool on the market"
I've been using Radarly for 6 months now and I've to say it's a really great tool. It has a very friendly user interface and impressive coverage of data (we have 17 entities to track all over the country). The graphs and reports produced are sophisticated and provide the user the flexibility to analyze huge volumes of mentions with minimum effort. My first need was to get insights on our main stores to give feedback/improvements from a customer point of view to the Business Unit directors. Online reputation monitoring is key for us to get better on what we do. It's easy to use, especially for me who are not from a direct marketing department. The support team is very helpful and most issues or questions are resolved almost the same day. You can do pretty much anything you'd imagine with this system, but sometimes you need support for complex queries if you're not a social listening expert like me. This is an extremely powerful tool so you have to be prepared to put the time in so you can use it effectively and learn your way around it. While it's easy to use there is still a learning curve involved. You need to be prepared for this and if you can allow for the time you'll definitely be able to use this to great effect. The Radarly team has made sure all the important information we might look for is available up front with a great UI that is easily to navigate. The team also work with us to ensure that we get the support needed and take suggestions to the development team to add and enhance features. The most challenging element is not the fault of the platform but the nature of social APIs in general. We would ideally like to be able to access historic data exhaustively but most social channels are limited in how far back they can go. This issue is however faced by all listening platforms and the Radarly team has a huge library of previously searched data for clients to draw on. The platform is ideal if you have a large number of clients or need a large number of queries and need flexibility over your search data usage. You can bolt on additional volumes of searches if necessary. The platform provides very easy access to the data with no need to separately build out charts yourself. You can even export reports straight to powerpoint! Our primary use for the platform is to understand how people talk about our client's products and their competitors. We will also look at specific events, as well as extrapolate portraits of the various people talking on social media. We listen during product launches and events to capture any resultant conversation. The wide possibilities offered by the tools in terms of impressions, clics, shares etc. and the cluster functions to find relevant cross topics. It's also really useful to compare the visibility of social media channels vs traditional web platforms and different websites accross the world with a wide category of different numbers, I really appreciated this part and we got a lot of positive feedback. Need quite a lot of time to understand for the first week, especially to set up the request and to be sure to volume is right. This was problematic at first but fortunately the support was quite helpful. The positive or negative analysis also seems a bit random sometimes, this could be optimised in the future versions. Concerning pricing, it's in the middle of market. E-reputation and crisis situations. We could identify sources and got the full info we needed. We also use it to find the last trends on some topics and find curation topics. "Une solution intuitive et performante"
CE que nous préférons sur l'outil Radarly, c'est le nombre conséquent de possibilités d'utilisation de l'outils. Nous sommes moins fan du paramétrage des alertes qui ne permet pas une personnalisation assez grande sur le volume selon nous. La construction des requêtes peut s'avérer vite complexe pour avoir une information de qualité sans "bruit" sur certains mots clés. Radarly est plus intuitif que les autres solutions que nous avons pu expérimenté (3) . Il offre également plus de possibilité pour un prix abordable. - D'améliorer nos relations "patient" online. "Best social media listening tool on the market in my opinion"
Very impressed with how quick the results come out in Radarly, that along with the fact that you can have them in real time will definitely help you have control over any online reputation crisis that might come out. The product provides a streamlined, time efficient process to search, monitor and analyse market and competitive intelligence information. In addition you get data research dedicated consultants if you need help. It scans the web and social media to provide and display information, but also helps to translate that data into meaningful content in a context that is visually pleasing. Like other listening tools, if you don’t spend the time, finding actionable information can be a challenge. Radarly pulls more data than most other platforms at the moment. Plus their data research consultants as mentioned above. The tool is easy to use and versatile. I regularly use it to find what our target audience are talking about and what they're interested in. It's vital to our monthly and quarterly reports for our clients, to demonstrate the effectiveness of our social content, to highlight potential influencers and to propose new content themes based on what our audience are posting about. It also helps with community management and identifying conversations that our clients can partake in. Not only that, but it enables us to track competitors and create benchmarks, so we can see how our clients are performing versus the market. It also enables exporting straight to ppt, which as a planner is massively helpful and saves me a tonne of time. Very little. The set up can take some time and requires support. To get the most out of the tool it does require general maintenance and iterative improvements - you're not going to be up and running and require no further work within a week or two. Very strong social listening tool - there are a number out there, but this is the real deal. It massively helps with reporting and positioning my agency as the client's expert for social. It helps me with the analysis and reporting of our content, and justifying what we've done. It makes it really simple to do regular reporting, saving hours of manual labour. I've used several social listening tools previously, and with this one I feel as though I get more information in less time. "Assurer la veille de la Ville du Havre et de son agglomération par une équipe de six personnes"
Lorsque la veille est assurée par une équipe de 9 personnes, la difficulté réside principalement dans la capacité à trouver une méthodologie simple à appliquer et commune à tous. L'outil Radarly permet cela , facilité par sa simplicité d'usage et son ergonomie. Simplicité, puissance et performance. Cela fait plus de 2 ans que nous vivons l'expérience Radarly et nous en sommes parfaitement satisfait. Il nous a permis notamment de suivre nos performances sociales lors d'un événement important pour notre ville et notre collectivité : le 500e anniversaire du Havre. Ses outils d'analyse statistique, les rapports et leur analyse est un outil indispensable aujourd'hui au sein de notre équipe pour ajuster notamment notre stratégie digitale, y compris de sponsoring, et permet d'ajuster et d'éditorialiser au mieux nos supports d'information et de communication, en créant une réelle complémentarité et transversalité entre le print, le web et les réseaux sociaux. "A lot of interesting datas." The team is always listening to us and ready to help with requests, studies, platform issues, etc. I like to create requests that I want and have a first impression quickly. The interface is intuitive and I like the fact that you can click and add different indicators. The interface can be personalized with the different views. I dislike the fact that there are a lot of functionalities that are not always easy to access (emoji cloud is a bit hidden for example). The setting panel is different from a project to another, one global would be more practical. The team is not communicating enough about the new functionalities, it would an advantage for them. Finding marketing insights on different projects. "Not only a excellent and efficient solution, it's supported by a very dedicated and helpful team!" - sales and support team are very dedicated and helpful: setup < 1 day! Get in touch with the sales team and ask for a presentation and demo. They're easy to do business with and very helpful. "A Reliable, Increasingly Immersive Experience"
As a someone who spends a lot of time producing social media reports, I like and use the analytics overview page the most. The options it gives you in terms of range of filters and areas for exploration is invaluable for enlightening conversation, audience and the nuggets that could shape new campaigns. I did think this would be not being able to export a list of posts, but I found out how to do that the other day. So after that I would say it would be the aesthetic. The dark backgrounds and greys can be a bit gloomy at times. If you are innovative and advanced in your usage of the tool, Linkfluence can help you cover all central campaign set up, management and evaluation requirements - and I could cite where this has been possible for us and exceeded the expectations for our largest clients. "Taking Social Intelligence to New Levels"
Radarly has served our agency very well in the past two years. The tool has allowed us to perform in-depth social media analyses for clients and discover fascinating insights. The user interface is easy to navigate and programming searches can be done easily in-house though we received terrific support from Radarly's client support team. Overall, the program offers a very good value proposition. Radarly is regularly updated which enhances the platform overall. However, we don't hear about this proactively and often discover improvements by delving into the tool. It would be beneficial for Radarly to sent out a short newsletter to its users to update them on new features. Excellent value for money and great client management support. We conduct deep dives into specific industries, analyze client campaigns, and have conducted media monitoring for elections. We also seek to discover which content resonates and how influencers operate. "Radarly, the companion of the social media manager"
Radarly is an effective tool for evaluating campaign engagement around pre-defined hashtags, to also list key influencers during the campaign. Necessary to measure the scope of my communication on all social media around the world. "A shortcut to social knowledge"
"The most powerful social listening tool in the world"
Radarly is the most extensive, powerful and user-friendly social listening tool I have ever seen and worked with. On top of that, Linkfluence, the editor of Radarly, has a very strong R&D policy, based on cutting edge innovations and, at once, on a user-centric approach, especially business wise. Some of the sections in the tool are useless and customers should be able to design the interface’s look and feel in the way they use it. Maybe a customized design and a set of data viz tools could be actionable too for the end customer. Brand performance, campaign KPIs, crisis anticipation and management, trend watching, end users’ consumption habits, and so on. "A fantastic tool for social listening"
Takes some time to get the hang of, which is not helped by the fact that much of the data seems to appear in many different places, adding some confusion to the tool. Excellent support is given, enabling validation of your own interpretations and also insight into ways of improving social interactions. Just make sure you take the time to familiarise yourself with the tool! We can now look holistically at the social media of our direct competitors to see how we compare and where we can improve. Also possible to view the trends of our client base. "Really easy and powerful social listening tool, excellent value for money!" Day to day alerting, long term analysis of my brand and of our competitors. First step Market Research when we are thinking about a new product or service. "a user friendly tool for impactful learnings"
Radarly is a very userfriendly and flexible tool. It enables to answer to a large range of questions from e-reputation to content strategy or campaign impact. The services provided by the helpdesk is too basic. People answer quite quickly to clients' requests but they can only provide help about the settings (is my setting formula is correct or not) but they never manage to provide help about the analysis itself (what would be more relevant to mesure towards the initial question). It is more a technical help rather than a project assistance. feeding content strategy, mesuring brands' e-reputation vs the competition, understand consumers' view/needs regarding specific industries or thematics, identifying market or societal trends. "great social media monitoring tool"
for me the most important thing is that a can see everything in one place, in clear categories and with easy comparison. Additional graphs and metrics help with data visualisation and preparing presentation and other visual aids. Moreover, Radarly enables listening to customers conversations, shows their problems and remarks. "My new best friend for SM monitoring"
I like the feature that allows me to find new influencers and discover hot topics for my targeted audiences. I would like to be able to exclude some sources from my feed, i didn't find a way to do it but it's not mandatory. My Radarly dashboard is constantly opened on my browser, it's a great way to find new content ideas and to measure the impact of my actions on social media. "Radarly : la meilleure façon d'analyser les réactions de nos clients"
j'aime sur Radarly la facilité d'utilisation (même si une rapide prise en main via une formation peut être nécessaire). En quelques cliques, on peut voir l'audience de notre service, les réactions des utilisations et d'où viennent nos clients. Le point négatif réside dans la difficulté de cibler les termes clés pour le service. Trop souvent nous avions des hastags trop génériques. De ce fait, beaucoup de réactions étaient intégrés dans nos analysés alors qu'elles ne concernaient pas notre service. "A complete tool to monitor social media, manage online reputation, and deal with the impact of SM"
Radarly is the most complete tool on the market. It can reach deep research levels. Its interface is simple, intuitive and modern. It makes possible to access the whole social media streams in real time and therefore to monitor important topics through keywords. Radarly makes possible to monitor engagement in different communities, to do international social media monitoring in multiple languages, to interact with customers, to create dashboards for every topics, as well as automate and optimize reporting to save a big amount of time. I would like for the number of authorized dashboards to be superior to what it is now. Therefore we can analyse all posts and get in touch with influencers. Moreover, Radarly offers competitive analysis and helps us to define our positioning compared to competitors’ communication. We can also identify influencers to contact them later. "Radarly is a powerful tool to harness social media intelligence and to detect emerging trends." The help from Linkfluence team navigating the system and helping make changes when needed. There really isn't anything that I dislike about this platform so far. They do have dedicated global services teams to help you grow and develop your project internationally. So if you're in a big company, and not only your team and country are related to this project, Linkfluence is definitely key in your project management. My recommendation would be to choose a provider with services teams, not just a tool (personal point of view). Linkfluence helps me manage and save much needed time. Especially for crisis management, it helps you identify negative reviews or conversations with their sentiment analysis feature, and the most influential people. Which helps me to: 1/not miss any comment from our customers; 2/prioritize the ones we have to manage first. UI is great. I like the influencers options, the NEAR operator is very usefull and overall the results are satisfying. Some filter needs to be added to prevent malicious (sometimes pornographic) posts that have thousands of kewords on purpose. I also had a problem with very specific fact we can't use "NEAR" operator with "RAW". Do net hesitate to contact support if needed. Very fast, efficient answers. Cybersecurity watch. Radarly is used to detect evry post related to cybersecurity issues that might be related to our company. It allowed us to detect malicious behaviours among internet users. "Un outil puissant pour des veilles efficaces"
J’utilise Radarly au quotidien pour effectuer ma veille. Avec des requêtes bien définies, c’est un outil puissant qui permet d’obtenir de bon résultats ! Of course, the main challenge of this kind of tool is the coverage and I'm impressed by the quality and the efficiency of their listening. Moreover, their analytics tools are well-though: it's easy to explore the data to find trends and important messages. Finally, export tools (to pdf and/or ppt) are helpful to create dashboards and media reviews. Query creation can quickly become complicated, but Linkfluence's teams are there to help. The interface could be refreshed, and it is not possible to analyze a set of hand selected messages. "MAKE UP FO REVER Review"
Back Office, the fact that we can have different régions, with tailored researches. We have detailed informations on our platforms, and contact with Linkfluence teams are very efficient. The fact that we could have. We can't see influencers posts, we have to go to the Instagram account and look for the image according to the text we saw. It doesn't gather Youtube UGCs that mention us in their description (now only in the title), which is more often the case. No content management, no social publication available for Instagram or Youtube. There is a looot of information, sometimes it's hard to organize it. Social Publications platform - Content Management (UGC) tool is HIGHLY RECOMMENDED in order not to compete with Sprinklr that seems to be super helpful in terms of community management and content planning. We managed to analyse the sentiment and the top influencers posts on each platform which is really helpful for us. "A user-friendly tool that offers access to a broad array of sources"
There are 2 main points: first I really enjoy the diversity of digital sources available in Radarly. We can get data out of almost the entire social web (blogs, forums, social media and so on). Secondly, the tool is user-friendly: Radarly is really easy to use in terms of exploring dashboards, parameterizing and building queries. Since the digital world is in constant evolution, it’s really pleasant to use a living tool that evolves and keeps on offering new features. Besides, the customer care is qualitative and deeply appreciated. Basically, you are not alone in the process. As the social landscape is constantly evolving, it would be great if Radarly could integrate new sources quickly (such as LinkedIn and Snapchat). We are a marketing agency. Therefore, we have multiple and diverse requests from our clients in terms of social strategies. Thanks to Radarly we can monitor our client’s competitors and improve branded content. The tool is also regularly used to measure product awareness or brand recognition. "A powerful crawling tool with a great expert request interface but a lack of semantic analysis"
"Good Data Aggregator - Otherwise restrictive"
It's strength is it's weakness. It isn't reflective of how each of the APIs work. "powerful tool for a better monitoring of our communication "
Radarly is a powerful software with great features which give the opportunity to monitor the social web. Thanks to real-time monitoring we found publications and articles about UTC we did not know of. We also discovered that some startups were talking about us. Thus, through community monitoring we found very interesting scientific publications for our university. Moreover, Linkfluence sends us alerts anytime in the week (even during weekends on our phones) if very important events occur on social media. Another very practical point: the influencer feature that allows us to know what communities and what people are saying about us. -Regarding the community management through programming tweets so that the university remains active on social networks even on weekends. An improvement of the web review feature would be great to be able to handle specific group items. We needed to know more about the impact of our communication actions and about our influencers. Radarly not only made possible to address these issues, it also made possible for us to go deeper by understanding and exploring our digital environment. We leveraged on Radarly to help managers understand the impact of communication campaigns by delivering key insights and metrics, therefore strengthening strategic decisions. good user experience and interface. the programmation of the tool is very complicated and needs an help. "A single tool helpful to get quickly actionable insights "
Easy to set up, Radarly gives quickly an overview of what is said on social media and on the web in general, in a single dashboard. Perfect to assess trends, measure changes compared to previous periods or identify key opinion leaders. The new functionalities regularly added is also a good point, showing a strong technical roadmap. The assistance provided by customer service, always reactive and useful, is greatly appreciated. The lack of transparency regarding which sources are monitored or not. There is not list user-accessible online. We need to ask the Linkfluence team. As a communication agency, we need consumers insights to identify what is already mainstream and what is new, in order to recommend actions and “fresh ideas” that made us more creative and others. We also use Radarly to monitor PR campaigns and market competitors. "Incredible stats, with a UI that’s trying to make it simple"
The depth of information and data that we can analyse across platforms. The complexity of the UI, there’s so much detail available but the UI is fairly simple for small tasks but a little confusing for bigger tasks. The ability to provide our clients with and insight into the trends repeating to what we’re pitching. "Lot of useful information all in one place"
Live streams - easy way to view multiple queries all in one place for efficient social monitoring. I think there is a lot of overlap between some of the features/information, which makes the tool slightly confusing. Good for monitoring social media. Slightly confusing for analysis, but still useful. Easily able to monitor social media to better understand what our clients want and what our competitors are doing. "Could be a good tool"
User experience, easy to use, nice graphs. "Easy to setup, actionnable insights for Online marketers and brand managers"
I've been following Linkfluence, the publisher of Radarly, almost since their inception a few years ago. They have been improving the product constantly, and today, the result is a neat dashboard allowing both observation and engagement for brands online. - "Add to favorite and Save": if you have a big conversation (say, telecoms operators in any given country) you might not being able to qualify manually the sentiment and more precise data for ALL the mentions. By "faving" and saving a selection of mentions, the dashboard is able to produce a visualisation of both the global volume, and of the selection of mentions made manually. Great to focus on the top 10% mention per influence for instance. - "Order by Influence": rank mentions on a given brand or product by influence (based on each platform's own data: RT and @ for Twitter, Likes/Share/Comments on FB..). I use it to filter out the top 10% mentions for a brand as I can't deal with thousands of mentions, I focus on the top of the basket. The transition from the "Social Inbox" where you deal with the mentions of your brand/product and qualify/analyse them to the "Dashboard" itself which shows the visualisation of the data of these mentions can take some time based on the volume of data. Not a big deal, you can really feel the whole thing is crawling a lot of data. I like the geekiness of the founding team, a gang of PHDs from UTC, a reknowned engineering university north of Paris, I like the easiness and care brought to the setup and navigation within the tool, and the visualisations create great impacts on clients. -> Customer insights on the long run, with a yearly follow-up of brand/product/competitor/industry mentions. That's quite a big volume of data, and Radarly helps us to sort out the most relevant ones and craft decisions for our clients based on what we see rather than based on assumptions we all have on a given industry. -> Agency brief: in agencies, it's pretty common to have to deliver a pitch "for yesterday", in the rush. You make assumptions, and have sometime no time to check their relevance. Radarly helps to get a snapshot of the online conversation and habits in no time (setup is fast and data retrieval for the past 60 or 90 days takes max 24h), and produce visualisations and insights we can use in a brief, making it data-driven and more professional. La précision dans les sources, Radarly permet d'ajouter de nombreuses requêtes et de pouvoir surveiller facilement sa e-reputation. Les dashboards fixent qui ne permettent pas une édition selon nos besoins précis en terme de KPIs. La possibilité d'éditer les dashboards. La surveillance de notre e-reputation client. Cela permet de venir chercher l'ensemble des requêtes qui parlent de notre entreprise pour y répondre au plus vite. "A complete Social Media Analysis tool"
An intuitive and user-friendly tool which affords in a lonely interface both overview, real time flow and very detailed indicators. Customer service on social media, monitoring or specific analysis and editorial management, Radarly is a complete tool. Timeline (the opportunity to choose a specific period of analysis) and the ability of crossing different indicators or having an highlight on a dedicated one are precious. The influenceur indicator is an interesting one (more and more useful on every social media platform and mostly for media or marketing campaigns) which nevertheless needs to be mixed with a strong knowledge of the brand's opinion leaders.
" One single tool for it all!" The software is quite easy to pick up thanks to its well thought through ergonomics. Anyone can quickly learn how to manage this Social Media Analysis tool, opposed to others I have previously tested. Radarly does it all if the user wishes to. For instance, there are two query creation modes, one through a very intuitive interface and another where you can directly write the queries yourself, for more experienced users. It is also possible to delete out-of-context and uncalled-for-results posts (pretty much impossible for a good part of the competition) which allows you to get accurate volume and tonality stats. I particularly appreciate the reliability of the collected data - especially concerning the language matter but also in terms of comprehensiveness - and the possibility of easily qualifying mass social media coverage. There is also the possibility of exporting different quotes at all times in order to deeper analyze them furtherly. At last, I find the “benchmark mode” very pertinent because it allows you to compare your own social media activities to the ones of your competition’s as well as the “influencers mode”, that facilitates enormously the detection of stakeholders around the reviewed subjects. All this without mentioning that Radarly evolves constantly, always taking in consideration the client’s needs and queries. Working in the tourism business, I would appreciate if Radarly could catch the opinions given on review sites, such as Trip Advisor, Zoover or Holiday Check for instance, especially because that would also be considered Social Media. But this is still very specific to the industry in which I act in any case. Also, it’d be interesting to be able to set up the report offered by email, according to different alert levels (volumes variation or specific key words), especially in case of a potential communication or operational crisis scenario. Giving that Radarly offers quite a numerous personalization possibilities, it’d be good if it would be let known in advance that a considerable amount of time should be spent to set the program up, especially when it comes to customizing the queries. This would allow having afterwards a completely reliable collection of data and then the possibility of making the best out of what this tool has to offer. Also I would advise to never hesitate on letting yourself be helped by Linkfluence’s support team. They know the product like the palm of their hands and are all in once available to guide you efficiently. - Evaluate fallouts related to my company’s social media activities and particularly around our digital campaigns (brand content, events we organise for example). - Long term personal client’s conversations analyses concerning our brands and products on the social web universe all together. With Radarly, I only have one social media tool that covers all these needs: it allows me to spare both time & money! 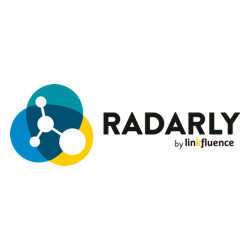 "How Radarly became a partner for digital influence strategy"
Radarly is a powerful platform that enables to retrieve a lot of information in a user-friendly interface. The service team who is in charge of providing with more detailed studies is key for me as the algorithms are ot sufficient to analyse the data which needs a human screening. I would like the platform to be more dynamic, for instance to see in real time which posts come up. The alerts format is not enough sharp and could be improved! The major differentiation from other players in that field is that the machine is not alone, humans are still there to provide with relevant analysis. Better kow our ecosystem, what are the communities around a specific topic, which change totally the wy you want to create buzz around a topic and who to activate. I did several mapping on different topics and discovered what I didn't expect which was very useful. sometimes there is bug. And it's difficult to work with. "A comprehensive tool for web and reputation monitoring. " Radarly has an easy-to-use and well-designed interface. The new version offers to build reports in an easy and fast way. I really appreciate that I can access on a single platform every sources that are talking about specific topics. It is a powerful solution that provides me with clear metrics and massive data. The sentiment analysis is not always accurate in Radarly. An update would be great. We needed to monitor the reputation of our corporate brand and of our product brands. Radarly allowed us to access every comments about our brands and to identify key consumers and influencers. Therefore, we were able to launch an efficient real-time marketing campaign engaging with Twitter users through funny Badoit GIFs. "Un outil globalement bon et efficace"
L'interface de Radarly est fluide et intuitive. Les nombreux paramétrages d'affichage du tableau de bord permettent une personnalisation très appréciable des données. Je trouve le temps d'indexation trop long. L'alerting mail est également faible (comparativement à d'autres outils). L'outil me permet de traiter un volume élevé de datas. La présentation en social wall est également fortement appréciée par mon client. "Excellent on a day to day basis, to monitor conversations and take part in them"
Make sure you take advantage of their teams. I think satisfaction with this kind of product only comes after a good setup. If you fail at doing this, you may blame the software, which would be unfair. "We use radarly in the pharma industry in more than 50 markets"
The interface and the way it has change how we take decision. We look at Radarly as the tool helping us taking the pulse of the webosphere. On top of that, the way we can collaborate on matters that can be challenging such as adverse events made it easy to ensure a quick response and a chain of events that is trusted and respected. Not truly linked to the tool itself, but the capability to track more than just web mentions is important. Looking at the share of voice and the editorial penetration of our brands, we want to compare the web noise to classical channels and see how they are impacting each other. I know that since the acquistion of trendybuzz by Linkfluence, this is coming and in the pipe. When it comes to selecting a tool, the true question is not what data are you collecting, but how you can make sense of it internally. Having a dashboard that is so easy to read, even if you do not speak the language of the mentions is key for us to take decisions and asses if our global activities are meeting their objectives. Radarly created a new language internally that we share as a team and this is how tools such as this one help even big pharma companies transform and mute themselves from within to become more agile. Having a global and local view of each brand noise and presence on the web. Making sure that we tackle new channels using agile tools even in a regulated environnement. * We monitor all Radarly reviews to prevent fraudulent reviews and keep review quality high. We do not post reviews by company employees or direct competitors. Validated reviews require the user to submit a screenshot of the product containing their user ID, in order to verify a user is an actual user of the product. Hi there! Are you looking to implement a solution like Radarly?